German politics is faced with an earthquake election come Sunday as Ms. Merkel’s conservative party is about to drop some 15% since the last vote result in her Christian heartland of Bavaria. The German mainstream press is preparing itself for their Sunday evening reporting already by speculating that Ms. Merkel is developing a so-called Jamaica coalition behind closed doors. Just as last year when the rightwing AfD took 14% of the vote in the federal election, any strengthening of their vote share in Bavaria will not be reported on by the evening TV-shows. Even their English counterpart BBC world managed to only mention the AfD during a 30-second segment in their 1-hour reporting on the matter in September 2017 and it would seem that by now the EU media had decided that they will instead focus on the upcoming wins for Green parties (predicted both in Belgium and Germany). 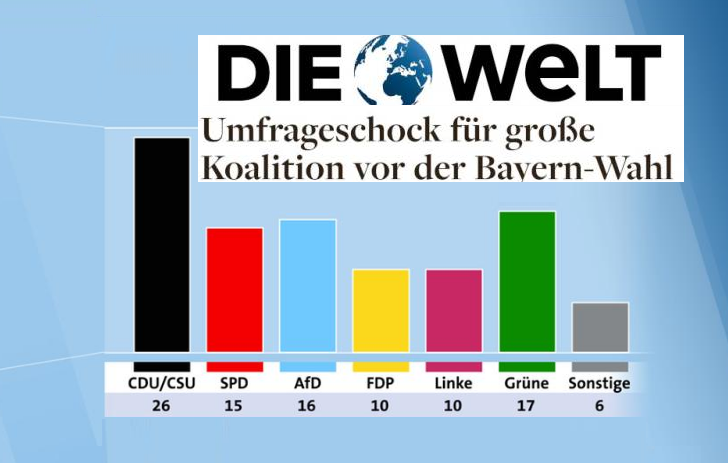 And thus, as from Sunday evening, even though it will become clear Ms. Merkel’s CDU-CSU continues to bleed votes to the right, the media’s focus will most likely be on the left side of politics where the Green party has now overtaken the Socialists in Bavaria. Related coverage: <a href="http://thegoldwater.com/news/39078-Germany-Election-CSU-Fears-Poll-Humiliation-Saying-Merkel-Made-A-Big-Mistake"> Germany Election - CSU Fears Poll Humiliation, Saying “Merkel Made A Big Mistake”</a>. Furthermore, last night’s federal poll shown on the Tagesschau (Germany’s national evening news) showed that the socialist have by now not only been overtaken by the rightwing anti-immigrant AfD, but also by the leftwing ‘Grüne’ (the Greens) on a federal level as well. Hence in order not to have to resort to the extreme left and include ‘Die Linke’ the left), Ms Merkel could already be scheming to create the so-called Jamaica coalition (as per the colors of that country’s flag which are black, yellow and green) both on a local (Bavaria) and federal level. In that manner, she could remain conservative within her own rank, please the industry by including the liberals who want to lower company taxes and reach out to the youngsters fearful over climate change (Europe had its longest heatwave in years). Looking at the thermometer, the temperature forecasts for Saturday shows 22°C and sunny for Munich, which is some 5°C above the normal average for this time of year. Discussing over a few beers Saturday evening about the climate, Germany could wake up to a Green party larger than ever before.